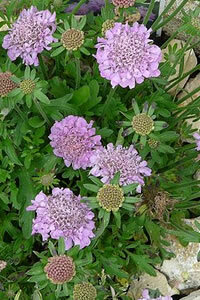 This perennial has finely divided gray-green leaves and bears solitary blue-lilac flowerheads from summer through fall. Height and spread 10 inches. Attractive to butterflies. For maximum freshness, please keep seed refrigerated in its original packaging until it is time to plant. Sow seed in containers in a cold frame in spring. Grow in moderately-fertile, well-drained neutral to slightly acidic soil in full sun. Protect from winter moisture. Deadhead regularly. Divide and replant every three years.